We are extremely happy to welcome a new author to Troy Books; Dr. Giles Watson. His first book with us, A Witch’s Natural History, illustrated with the author’s own artwork, is now available for pre order in both paperback and hardback editions to our subscribers. All pre ordered copies will be signed by the author. A Witch’s Natural History,originally published as a series of essays in The Cauldron, is a meditation on the relationship between folklore and nature. The world’s dogmatic religions all have their devotional texts, and biological science, too, has its own rationalistic equivalents, from Darwin’s Voyage of the Beagle to Richard Dawkins’s The Ancestor’s Tale. Natural historians have written their works of devotion to the works of nature: a genre which has been recognisable ever since Gilbert White wrote The Natural History of Selborne. It is at work in the poems of John Clare, and the essays of W.H. Hudson, Richard Jefferies and Richard Mabey, but it also stands at the centre of the beliefs and practices of modern pagans. A Witch’s Natural History is intended as a small contribution to modern witchcraft’s own devotional literature of nature, drawing on scientific, folkloric and experiential sources. Giles Watson explores the lore, legends and life-histories of a selection of animals which are commonly employed as motifs in the history of witchcraft: culturally maligned creatures such as reptiles, amphibians, crows and rats. 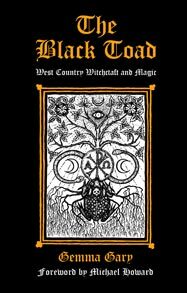 He also casts light on the magical significance of more commonly neglected birds, spiders, insects and snails, before turning his attention to plants, and whole ecosystems which have cultural associations with witchcraft. He combines a call for a new reverence for nature with a fascination for some of folklore’s strangestrepresentations of our dependence upon it: from the toad-bone amulet in East Anglian witchcraft to the seductive Queen Rat of the Toshers in Bermondsey. This is a book not only for those practitioners of the Craft who wish to be more informed in their response to the natural world – but also for anyone who is interested in natural history and its impact on folkloric beliefs and practices. One hundred and seventy four pages in content, the paperback binding is to be presented in Demy format. The hardback edition is to be presented in a Royal format gold foil-blocked case binding in Green, with green and black head and tail bands, and Aubergine end papers. Troy Books has now taken delivery of the paperback edition of Gemma Gary’s The Black Toad, and the dispatching of advance order copies has begun. We had expected to take delivery of the hardback edition at the same time, however our printer has reported a delay, and so dispatch for these will begin a little later.